Of course, not being one to do the usual thing & follow the traditional recipe, I've changed it up a bit & made it my own, adding flavor elements inspired by other Ethiopian beef dishes. Also making their appearance in this dish are jalapeño peppers & red onions (which are commonly found in the dish, Zilzil Alecha) & tomatoes (which are also a featured ingredient in dishes like Key W'et). 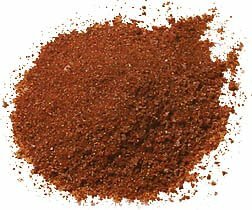 Also to save time & simply the preparation process, the Berbere spices are just tossed in during the cooking process instead of toasting the spices separately in a skillet. 1. Chop up all ingredients: Cut steak into cubes & put aside. Season lightly with salt & pepper. Chop up onions, garlic, jalapeño, & tomatoes. Put each ingredient in a separate area/surface or bowl. 2. Turn on stove top range to high heat. Since this is a stir-fry, you need to use a wok or a large pan that can withstand/retain high heat. 3. Add olive oil, & then onions & garlic, to pan. 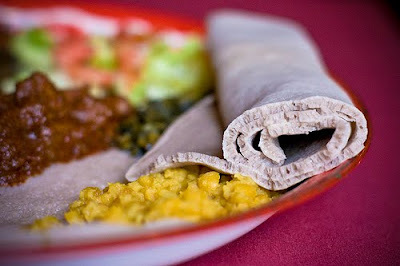 Sprinkle Berbere seasonings on top & stir quickly, making sure that ingredients don't burn/brown. Cook onions & garlic until translucent, i.e., about 5 minutes or so. Regarding seasoning measurements: What I did was basically eyeball the seasonings & then lightly sprinkle a light coating on top of the onions & garlic, but if you prefer, you can make up a small batch of spice mixture beforehand, following the precise proportions, & then lightly sprinkle the mixture on top. If you have extra you can always bottle & store it for later use. 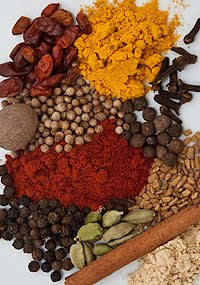 Please note: It's important to be conservative in adding the spice mixture; you can always taste your food as it cooks & add more later if needed. 5. Add meat to stir-fry. If you don't hear a sizzle when the steak hits the pan, your stove top range's heat isn't turned up high enough. Meat will cook fairly quickly. Be sure to allow enough room in pan to cook all ingredients evenly. 6. Deglaze pan with red wine. Only use enough to coat the bottom of the pan. 7. Next add diced tomatoes & jalapeño & keep stirring. 9. Remove from heat & serve. Enjoy! 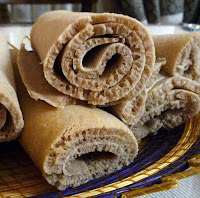 Serving suggestions: I recommend serving this dish with injera (a traditional Ethiopian fermented pancake-like bread) or couscous that's been simply seasoned with olive oil & salt. Since there's a lot of flavor in the beef stir-fry, you'll want to keep any complementary carbs-based side dishes fairly straightforward & unadorned. Chef's Notes: Hanger steak is a butcher's cut of meat, & is typically only about a 1-1.5 lb. cut of meat. It's less expensive than tenderloin (which is best used for other dishes anyhow), & works well with stir-fry dishes because it has a lot of flavor & won't dry out when cooked under high heat like other cuts of beef. It's not as lean of a cut as London broil (hence its slightly marbled appearance), but the extra little bit of fat in this cut is actually necessary for flavor & moisture. If you don't have access to a butcher, flank &/or skirt cuts, which can usually be found at the grocery store, will also do. The latter of these cuts are often sold in much larger quantities, 2+ lbs., etc., so just take what you need & either refrigerate or freeze the rest for later. Jalapeños are fairly mild peppers, but if you'd like to decrease their "heat" even further, just scrape out the seeds & discard them. This is where most of the heat from hot peppers originates. If you'd like to make the dish less spicy overall, just cut down the amount of Berbere that's originally called for in this recipe.